PSS is a specific physical layer signal that is used for radio frame synchronization. It has characterstics as listed below. Mapped to 72 active sub carriers(6 resource blocks), centered around the DC subcarrier in slot 0 (Subframe 0) and slot 10 (Subframe 5) in FDD. 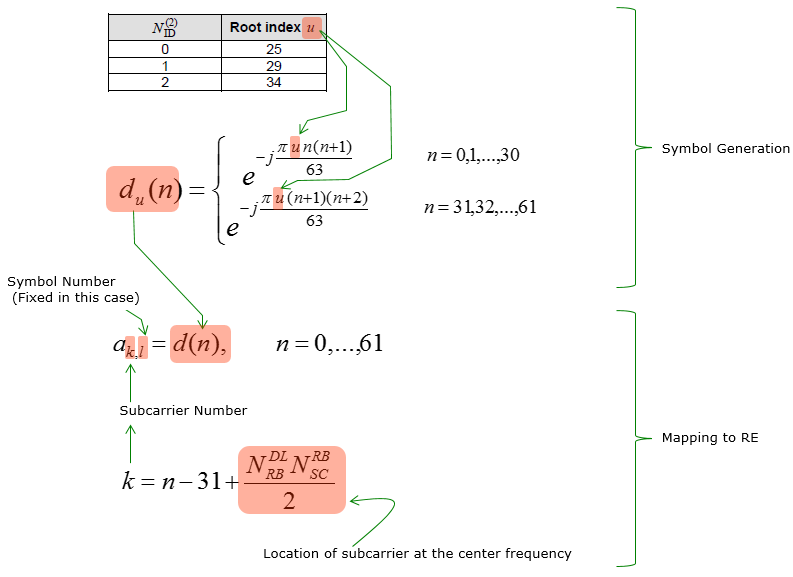 Mapped to 72 active sub carriers(6 resource blocks), centered around the DC subcarrier in slot 2 (Subframe 2) and slot 12 (Subframe 6) in TDD. May Not be a big issues for most of the case since it would be working fine for most of the device that you have for test. Otherwise it would have not been given to you for test. However, If you are a developer working at early stage of LTE chipset, this would be one of the first signal you have to implement. The exact PSS symbol calculation is done by the following formula as described in 36.211 - 6.11.1. For the specific example of generated PSS, refer to Matlab : Toolbox : LTE : PSS page or PSS with default Matlab function. 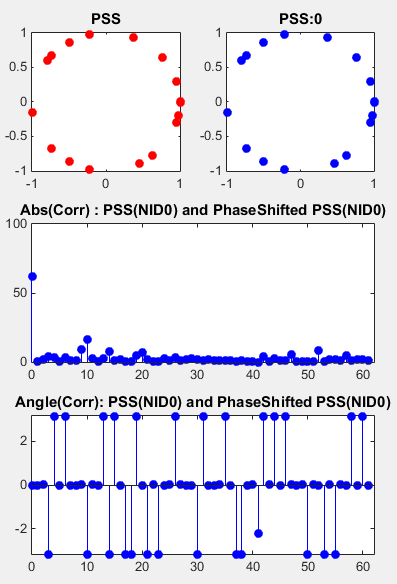 Followings are the Matlab code for generating PSS and its result for each NID value. Threre are three types of PSSs in LTE. 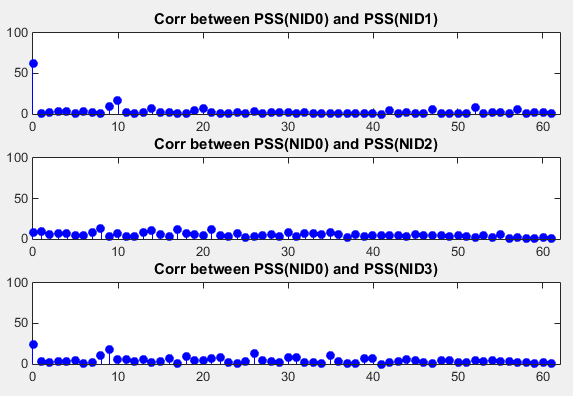 To make all these three type unique (distinctive to each other), it is designed that the cross correlation between each PSS be very low. 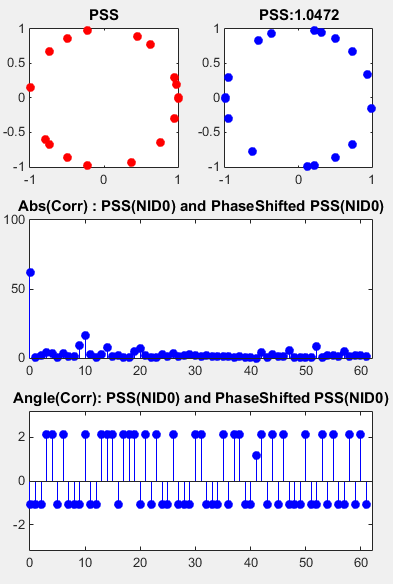 Following example shows the cross correlation between each PSS. This example shows the correlation between a PSS and its phaseshifted copy. As you see here, the magnitue (absolute value) of correlation does not changes even if you do phase shift. However, you can figure out the degree of phase shift by taking the angle of correlation. With this property, you can identify a PSS in a received signal without worrying about any possible phase shift that might have occurred by communication channel. In addition, you can figure out the amount of phase shift by taking the angle value of the correlation and use that value to compensate (undo) the phase shift. This example shows the noise tolerance of PSS. 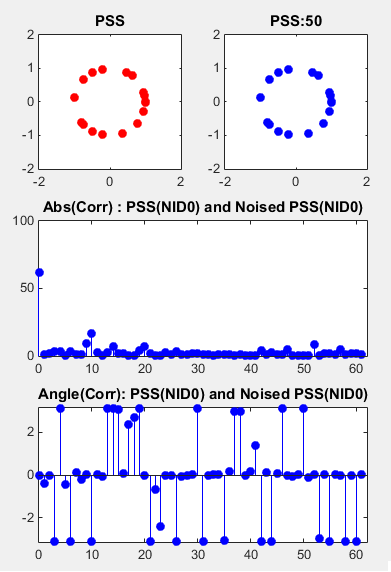 The example on the left shows the correlation between a PSS and the one with 50 dB SNR (practically no Noise condition) and the example on the right shows the correlation between a PSS and the one with 10 dB SNR. Following is the matlab source code that produced the result shown above. 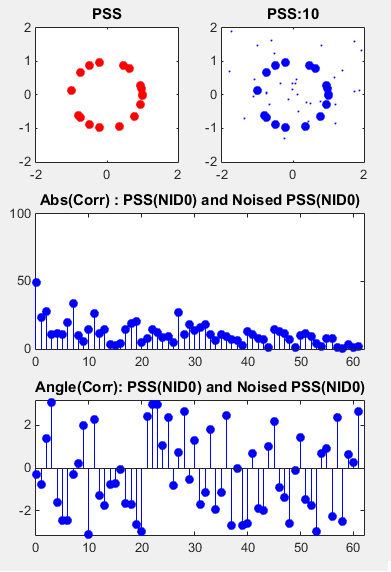 I used Matlab dsp package to calculate the cross correlation. If you don't have Matlab dsp package, try to write your own script for calculating cross correlation.